Roomy 2400mm x 900mm – Versatile zip-out flannel liner for all weather versatility -5°C to +5°C rated! – Tough poly-cotton exterior - zips together to make double sized - includes compression bag. 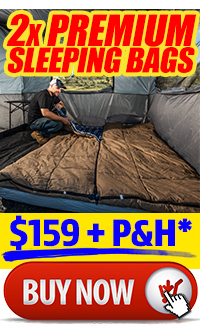 Take your night’s sleep to the next level with Adventure Kings Premium Sleeping Bags! A good night’s sleep out in the bush starts with a quality sleeping bag - it needs to be able to stand up to the cold, spacious enough for you to move around and hardy enough to survive the rough. We’ve answered all of that and much more with the Adventure Kings Premium Sleeping Bags. Spending countless nights in the bush, we’ve taken everything we’ve wanted over the years and engineered it into one, all weather, all temperature, tough yet supremely comfortable sleeping bag. • Tough 270GSM Poly Cotton Canvas Exterior, shields from cold and resilient against scratches, moisture and tearing. • Super comfortable 125GSM Flannel & Polyester inner layer, soft to the touch and keeps the warmth in. • Generous sizing – tons of room to spread out, 2.4 meters tall & 900mm wide, it’ll fit even the biggest blokes. • Connects with left or right hand Adventure Kings Premium Sleeping bag to form a jumbo sized 1800mm wide sleeping bag! Perfect for couples. 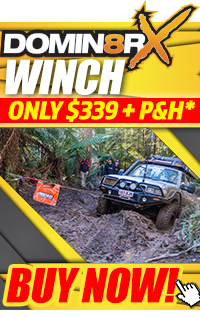 • Removable inner layer - usable all year round, hot or cold, anywhere in Australia. After a hard day 4WDing & camping you deserve the best possible night’s sleep; with the Adventure Kings Premium Sleeping Bag – you’ll get it! 1.3m waterproof LED camp Lighting - 1200 Lumen output – mounts with clips or Velcro loops - 5m cable Cig socket or alligator connectors - integrated dimmer switch and carry bag. 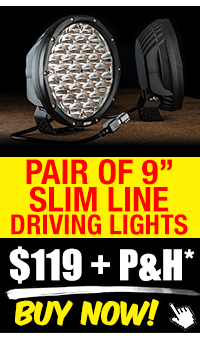 A must have for any camp site, boat or area that requires maximum light output without taking up much needed space. The Illuminator Max LED Strip Light can be easily attached to the underneath of Awnings, inside Awning Tents and Roof Top Tents. See Why Premium Sleeping Bags are Good for Summer and Winter Camping - No joke! Guests staying over? 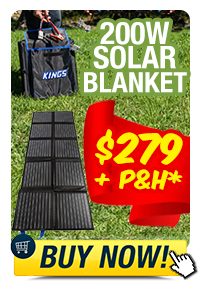 Forget the blankets, give them an Adventure Kings Premium Sleeping Bag instead! 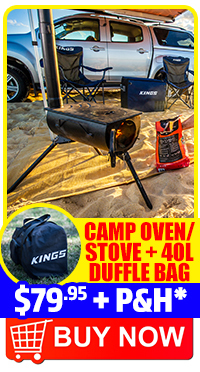 Check out the Premium Sleeping Bags from Adventure Kings! Light your Campsite in less than 30 seconds with the Adventure Kings 1m Strip Light! WHAT DOES LEFT ZIPPER MEAN? Adventure Kings sleeping bags are available as both left and right zipper designs – Left zipper means that while you’re inside the sleeping bag, laying on your back, the zipper edge will be on your left. Right zipper means that while in the bag, laying on your back, the zipper will be on your left. WHY IS THERE A +5° TO -5°C RATING? WHAT DOES RIGHT ZIPPER MEAN? With snaphooks at each end as well as Velcro straps, there are a huge amount of ways to fit this to your campsite – under the awning, onto your roofrack or inside your Roof Top Tent are some great options. It comes with a cig plug and alligator clips so you can power it directly off a battery or from a cig socket. You can turn the light on and off with the dimmer by tapping it, or hold your finger to dim or brighten the light.